The comfort and convenience of our guests is our primary concern. All of The Jefferson Inn’s guestrooms are tastefully furnished with a combination of period antiques and incredibly comfortable beds and mattresses. 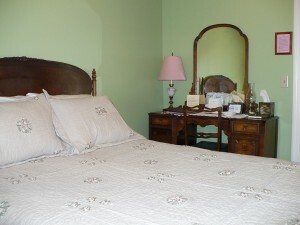 We have four beautifully decorated bedrooms and one luxury suite in the main house, each named after a former owner. A full gourmet breakfast is included and served each morning from 8:30-9:30 am in the dining room. All rooms have private baths en suite, cozy bathrobes, hairdryers, alarm clock/radios, sound machines, central air conditioning, separate heat controls, outgoing telephones, free wireless internet and access to the outdoor hot tub. 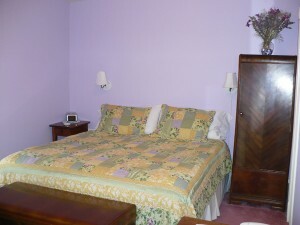 All the essentials for your comfort are available in your rooms: extra pillows, blankets and towels. 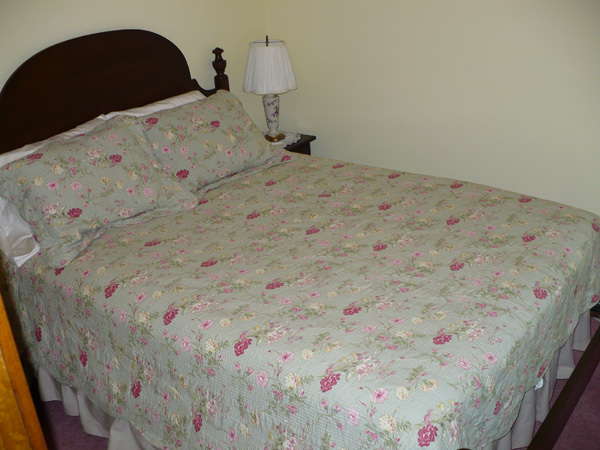 Children over the age of twelve are welcome to stay in the main Inn. Regrettably, the atmosphere of the main house is not suitable for young children. 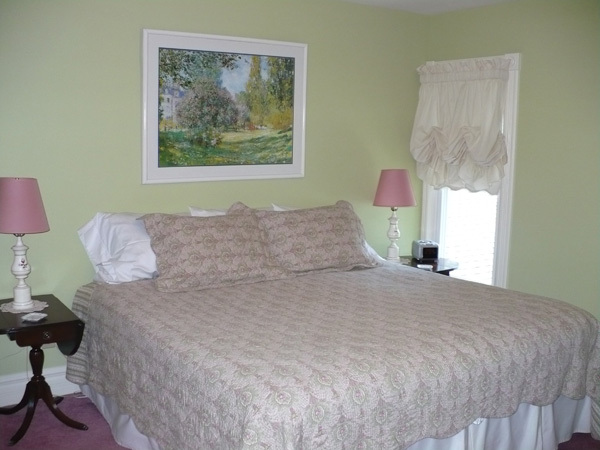 We offer two efficiency suites for families with young children or pets. Relax in soft elegance as the sun falls through the windows in the early morning hours and the chime of local church bells calls to you. Named after a previous owner of the original home, the Mary O’Rourke Suite is tastefully decorated in natural wood and jewel tones. 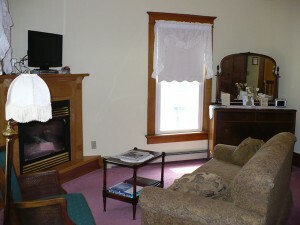 This two room suite boasts a private sitting room with TV/DVD, fireplace and sofa. The separate bedroom has a queen bed. 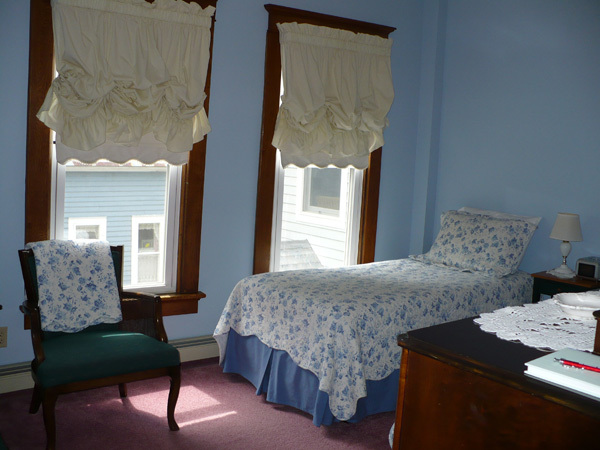 Sunshine from the two windows cascades across the two twin beds in the Robert Shankland Room. Robert Shankland, the original owner of the house and the owner of the Cattaraugus Republican, would have enjoyed sitting in the easy chairs to read his morning paper. 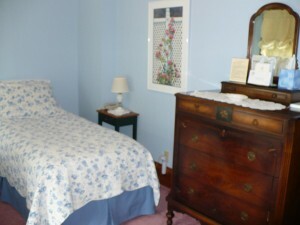 The room is decorated in Wedgewood blue. If preferred, the twin beds can easily be converted to a king. Cute and cozy! For our single traveler or couple, we have the perfect room with a comfortable queen bed, armchair and desk that doubles as a dresser. This room’s window looks north to the hills. The McMahon’s lived in this home from 1885 to 1898 and ran the local hardware store. The room is decorated in green and cream. Whether it was Mr. & Mrs. Fraser or their daughter Violet, they would be delighted today with the fresh, airy feeling of the sea grass green room while reading in the king-size bed or curled up on the settee. 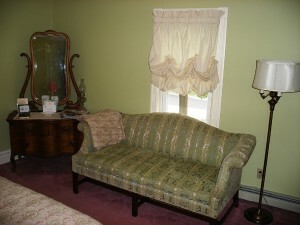 Snuggle up on the loveseat in this romantic room overlooking Jefferson Street. 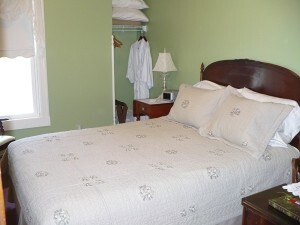 The comfortable king-size bed and the quiet atmosphere are relaxing. If preferred, the king bed can easily be converted to two twins. Two generations of Hickeys owned the house. 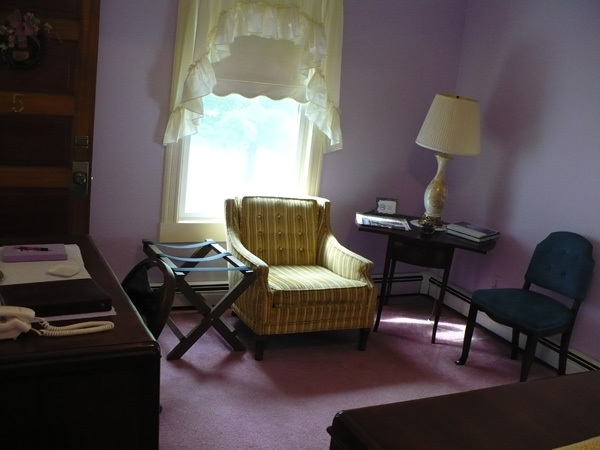 The women in the family would have loved this lavender hued room overlooking the village park and gazebo. The Elizabeth Hickey room has a comfortable king bed which can be converted to twin beds if desired. Check out our weekday ski specials!